The Half Hollow Hills High School West football team celebrates its 34-6 victory over Plainedge in the Long Island Class III title game at Hofstra University on Nov. 24. 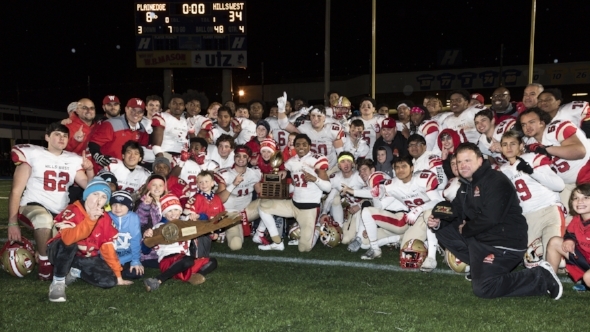 The Half Hollow Hills High School West football team showed that defense really does win championships on Saturday when they defeated Plainedge 34-6 to claim the Long Island Class III title. The Colts halted Plainedge’s 11-game winning streak at Hofstra University, holding the Red Devils to just 6 points all game. Junior running back Justin Brown scored the first points of the game late in the first quarter when he broke through the defense for a 75-yard touchdown run. Brown scored again in the fourth quarter and rushed for 166 yards in the game. Senior quarterback Gerald Filardi avoids a tackle during the Colts 34-6 victory over Plainedge. The game exploded into life late in the second quarter when senior running back Deyvon Wright extended the Colt’s lead with a 7-yard touchdown run. The Red Devils responded with their only touchdown of the game less than a minute after Wright’s touchdown run, but Plainedge wasn’t able to celebrate for very long. 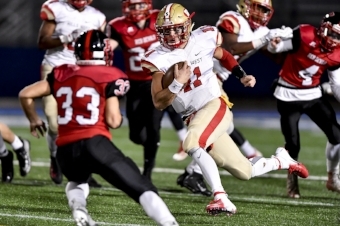 Senior quarterback Gerald Filardi showed off his versatility when he returned the ensuing Red Devil kickoff 76 yards for a touchdown. After the scoring flurry, Hills West took a 20-6 lead into the locker room at the end of the first half. The Colts quickly extended their lead at the start of the third quarter when Wright capped off the opening drive with a 49-yard touchdown run. Plainedge’s second quarter touchdown was the first and only hiccup for the Colts defense. Linebackers senior Michael Carubia and junior Joey Venezia were strong in the heart of the Colt defense. Carubia led the team with tackles, while Venezia had seven. Junior defensive back Eliot Porter helped keep the Plainedge offense off the field with two interceptions in the game. Brown’s fourth quarter touchdown run finished off the 34-6 victory for the Colts, the team’s second in program history.